You guys...This month's HHCs are ALL amazing, stunnning, brilliant, and beautiful. Each brand has completely knocked it out of the park. Each time I swatched a polish, I wanted to stop right there and wear it for a day or more. You need all of these. I usually present the polishes on my blog in alphabetical order, but decided to change it up this month and reverse it! begins with notes of fresh cut roses joined with sea salt, sea moss, vetiver and notes of ambered musk to create a luxurious spa-like scent inspired by Queen. Very fresh and clean, slightly floral. It reminds me a bit of a plumeria flower's scent although it has no plumeria fragrance in it. a dark grape jelly polish with shifting aurora pigment and green sparks inspired by Marvel. Super vibrant and juicy looking! The green shift is apparent under different light sources - I love this polish! inspired by the song "I think I'm Paranoid" and Shirley Manson of Garbage. 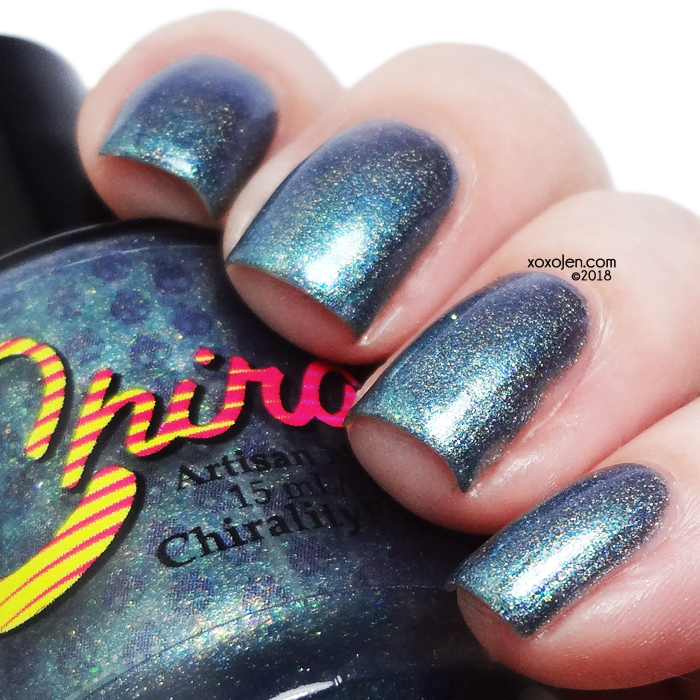 Described as a slightly deepened turquoise creme base with clear holo pigment and pinky red shimmer. The shimmer in this shifts and sparkles as your fingers move! Beautiful shade of teal. 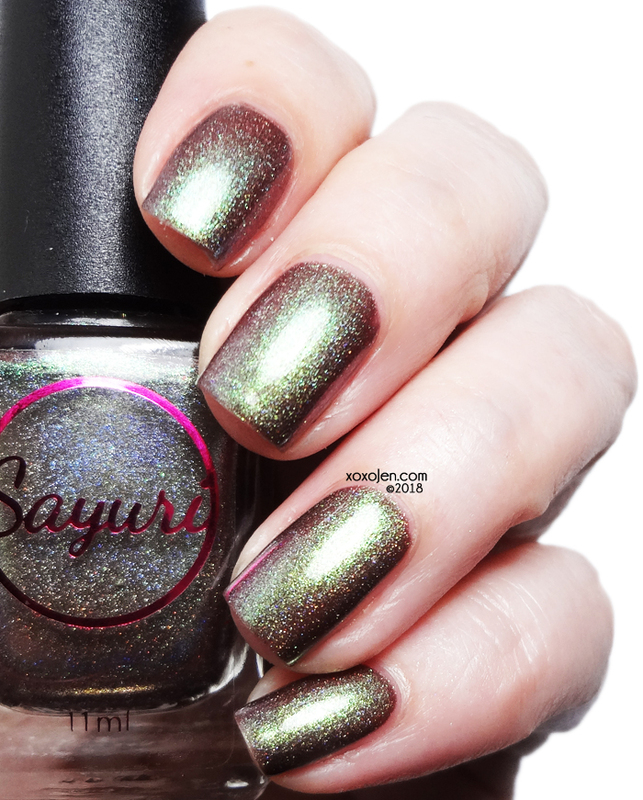 an earthy brown holographic polish with a strong olive green metallic overlay inspired by Studio Ghibli. Tricksy, yes! I love how this one's base shade looks reddish sometimes and brown sometimes, while the green shimmer is strong all the time. 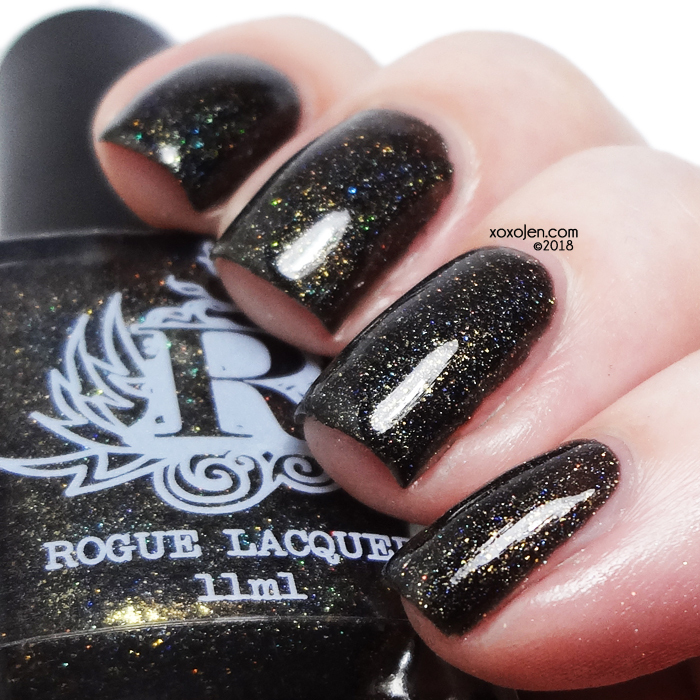 a creamy black holo with micro holo gold glitter and gold shimmer flecks inspired by The Justice League. Beautifully done black holo polish with a gold sheen, every element in this polish is seen and not muddied by the base. How did she do it!? 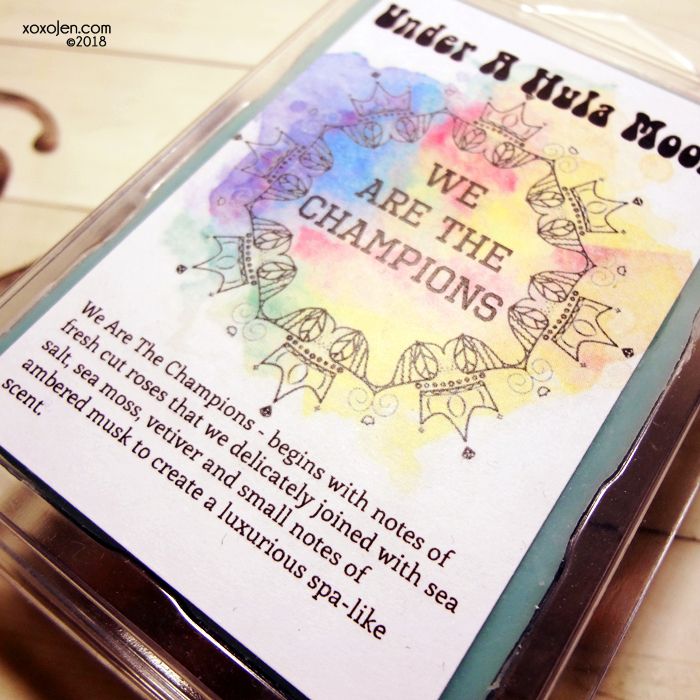 It is a white crelly with neon green glitter, blue and red micro glitter, gold, green, red, blue and violet flakes, cyan-blue-red shifting shimmer and a touch of holo. 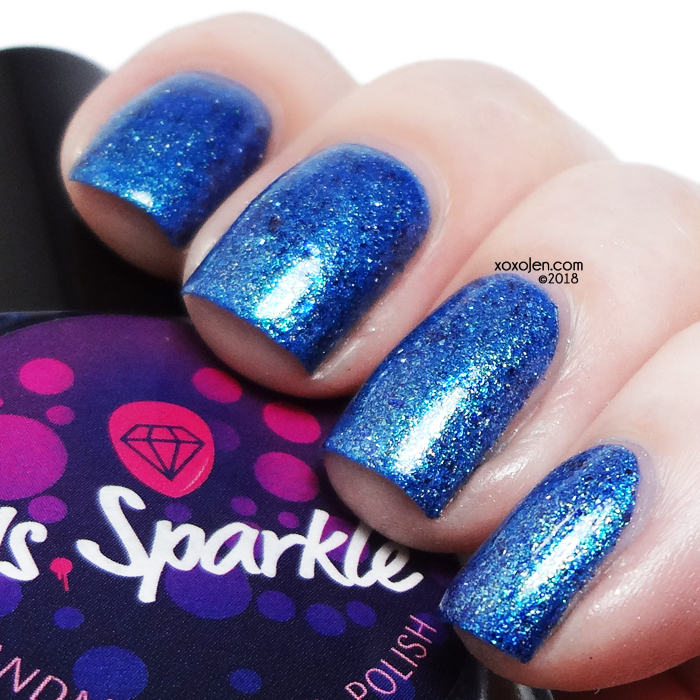 This polish takes me back to when crellies were new and super popular, a classic with an upgrade of shimmer and flake. mauve Crelly with colour changing flakies and copper holo glitters with a touch of red shimmer. I really enjoyed wearing this shade, and when I added nailart I loved it even more. It was tough to convince myself to take this polish off. Stamped with Moonflower Selene in a cherry blossom pattern. a blue crelly with a yellow micro flakies, gold shimmer and aurora pigments, holo sparkles and ucc flakies inspired by Vintage Toys. 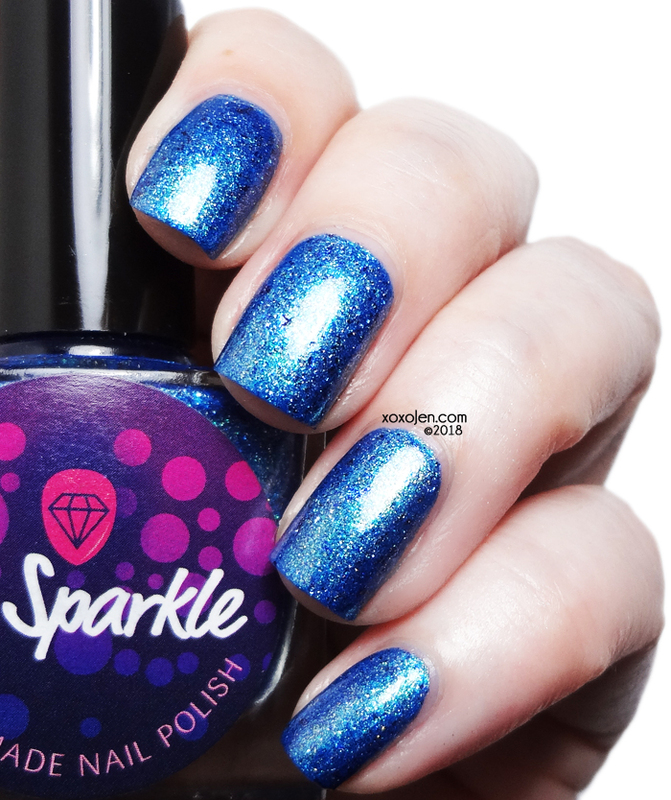 A very vibrant blue with shimmer and sparkle. oxblood crelly base packed with pink/red shifting shimmer, red/gold holographic flakes, and scattered holographic pigment inspired by The Magicians. I love vampy shades and this one is a black cherry shade packed with flakes! a dark blue gray tinted base packed with holo sparkles, copper shimmer, red/green aurora shimmer and iridescent flakes in pink/gold & green/pink inspired by The Craft. Done in true Illyrian style, this flake is all that and a party of sparkles! a dark gray to dove gray thermal with indigo-blue-violet aurora shimmer, holo microflakes, pink-violet-blue-gold UCC flakes, and red and green holo microglitters inspired by Bob's Burgers. I have a thing for grey polish and this one is TWO grey polishes in one! Yes, please. a rich indigo jelly full of chameleon iridescent flakies that shift red, copper, green, blue and bright violet, holographic sparkles and a mystical red to green shimmer. Indigo is such a nice shade and this one is no exception. 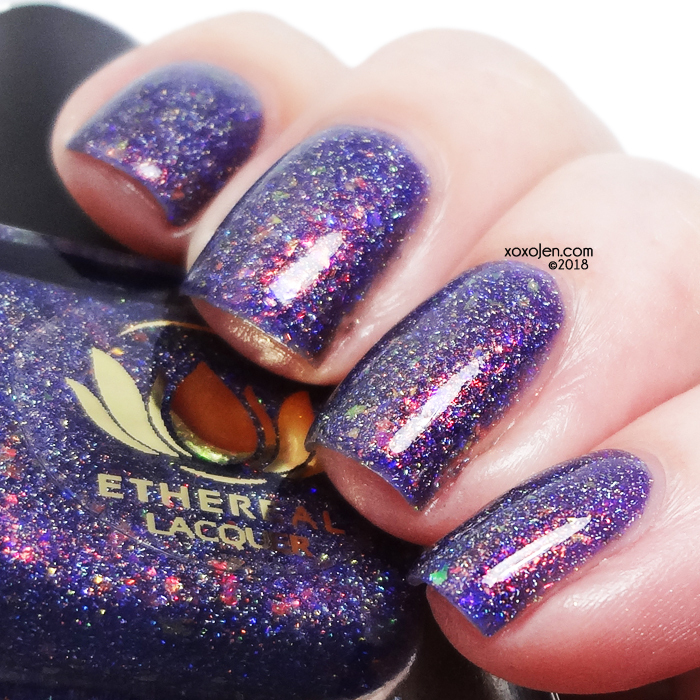 This polish checks all the boxes for me, shimmer, flake, holo, and a shade of purple. a periwinkle holographic with a subtle foil finish, mixed with iridescent and foil multichrome flakes (gold/orange/green/blue/magenta) and red/green shimmer. This is what I like to call an "Aubrey" shade. 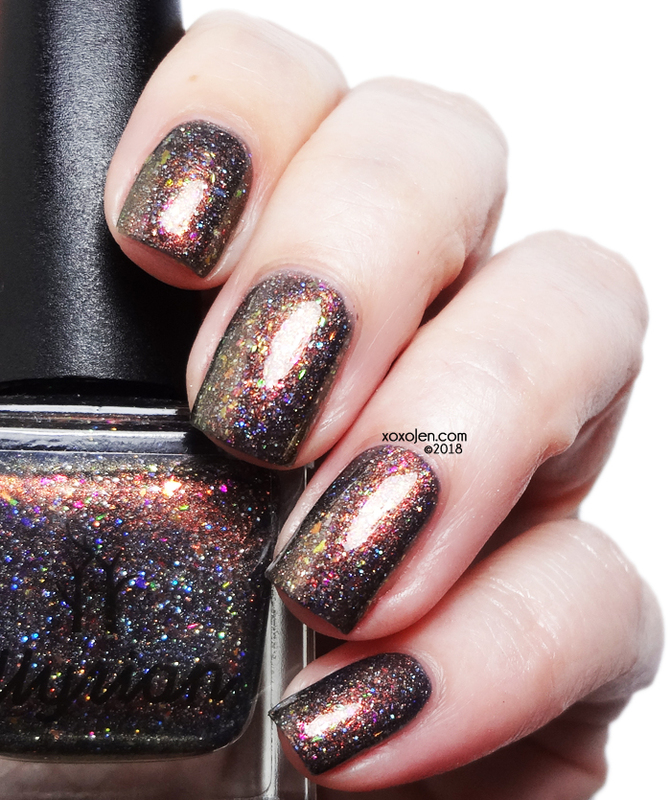 Soft, light, sparkly, and shifty - it's like an iridescent unicorn horn! 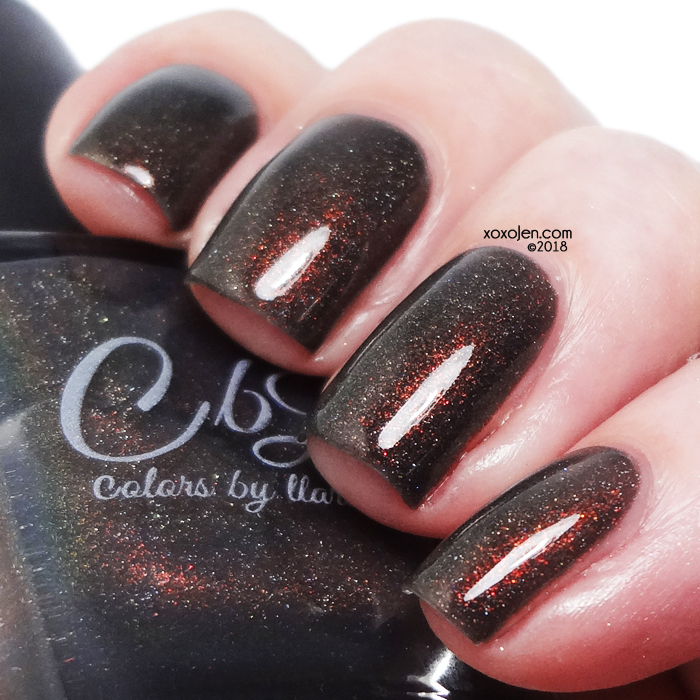 a charcoal grey base filled with OG UP and scattered holo finish inspired by Bruno Mars. Quite shifty and beautiful. It looks like I'm wearing brown or green depending on the angle of light hitting it even though it has a definite grey base. Yes, I love grey polishes and their mystery! 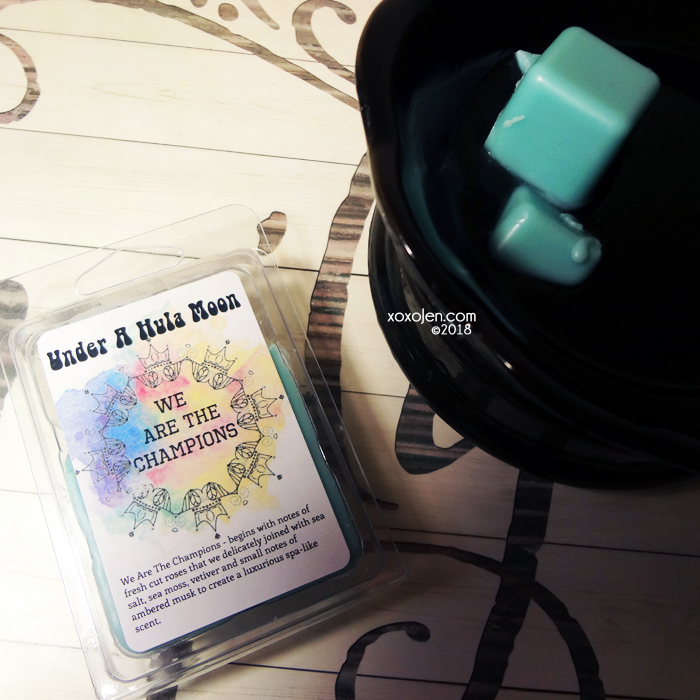 a teal to blue to violet shifting holographic base color with a green to gold to teal to blue intense shimmer inspired by Dr. Who. All the polishes I've reviewed are shown in 2 coats with topcoat. No issues to report with formulas. Do you have your shopping list ready for launch day? 12/13 7:01pm HST/8:01pm AKST/9:01pm PST/10:01pm MST/11:01pm CST and 12/14 12:01am EST through December 21st at 11:59pm HST. Polishes will start shipping by January 22, barring any unforeseen circumstances. In my review, I've included all the products that were sent to me. I've used kbshimmer Clearly On Top tocoat and Fillin Groovy basecoat for all swatches.